The Nashua Warriors ran into a tough Pelham defense, despite the blocking of Ian Leonardi, CamRon Pena, Devon Dattoli and Andrew Vertigans. Defensive standouts for Nashua included Adrian Cruz, Connor Johnston, Jack Krulikowski, Nick Wilkinson, Tayten Zubhuza, Kobe Perry, Jayden Beaulieau and Mason Dandeneau. A long Perry run with just over two minutes left set up Nashua’s lone TD, a 1-yard run by Dylan Noble. Note: Scores are not recorded at this level. Nashua improved to 2-0 as scoring came from Julien Gonzalez, Tyler Armeen, Jayden Espinal, Xavier Provost and Eddie Bracetty. Robbie Long had an extra point kick. Offensive standouts overall for the game included Long,Gonzalez, Espinal, Provost and Corey O’Day enjoying some postive runs. 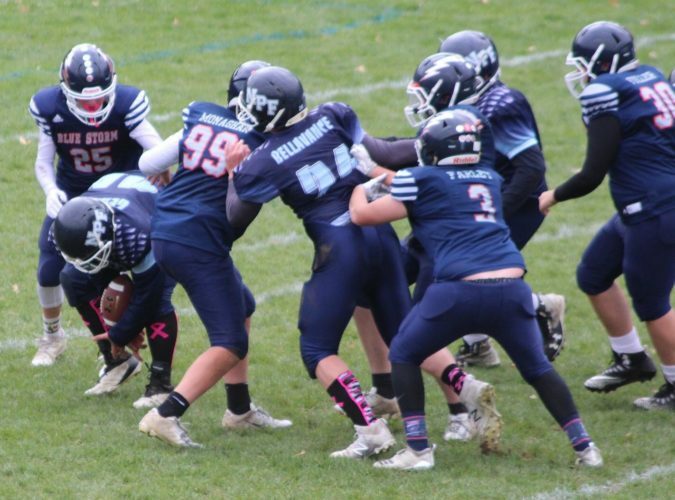 Ethan Gaffney, Jesse Njuguna, Kobey Marshall, Justin Edwards, Adam Tambouris, Max Ackerman and Spencer Whiting all blocked well while Provost made a spectacular interception in the fourth quarter, denying Milford of a touchdown. Other defensive standouts included: Chris Acevado, Maxwell Ackerman, Edwards, Devin Bracetty, Neo Helin, Collin Quinn and Long Anthony Carrion and Edwards each had a fumble recovery. The PAL 14U team hosts Londonderry on Sept. 11 at Stellos Stadium. In its first game, Nashua blanked Londonderry 16-0 with touchdowns by Provost, Espinal and two PATs from Robbie Long. Defensively, Acevado, Ackerman, Aiden Bashor, Edwards, Devin Bracetty, Neo Helin, Quinn and Long, among others, all played well. Kobie Perry’s 98-yard TD run with 50 seconds left was the key play of the game. Nashua had strong defensive effort from Adrian Cruz and Nick Wilkinson (key fumble recovery) and offensively a key TD was scored by Tayten Zubhuza. Nashua got good tackling from Patrick Zelanes, Xavier Torres, Warren Farley, Aidan Prowker and Jayden Turcotte, as well as, Ian Gillis, Chris Beaudion and Charles Dabrowski. Jayce Cora scored two TDs, the second on a TD pass by Ryder Clancy. John Barry’s late TD run and the subsequent extra point made it a successful season opener for the Wolves. Zach Samarel also scored for Nashua, which also got great play from Braedyn Mellen, Dylan Boutchia, Evan Taylor, Noah Harvey, Nicholas Wardner, Danuel Morales, Damon Clark, Gavin Flynn, Trevor Rivard and Kaleb Milano. Also having good games were Jace Colon, Elijah Dabney, Michael Reyes, Elijah Simard, , Adrian Lazo, John Forcier, Dylan Boutchia, Evan Taylor, Nicholas Wardner, Danuel Morales and Damon Clark. 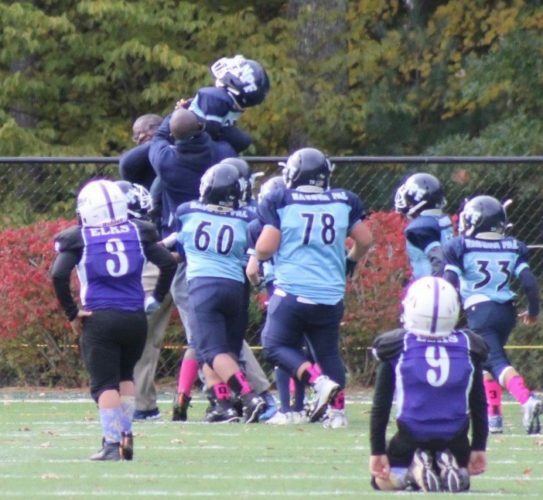 The sixth-grade defensive line of Adam Noone, Toby Brown jr, Zach Connerty, Xavier Jalbert, Aiden Carrion and Xavier Francis set the tone, as well as, Derek Finlay, Ethan Preston-Teixeira, Devin Mcneil, Reagan Brunet and Mekhi Gerrin. Offensive linemen, Brady Sullivan, Bryson Borromeo, Lola Cambray, Reid Lavoie, Dario McAniespie and Demitriz Sanchez made way for several touchdown runs by Patrick Keegan, Jack Peters, Charlie Bellavance and Amuary Almonte. Ryan Flynn also ran well. Teammate Mirolqui Tavarez was a sideline inspiration. Nashua Cal Ripken Fall Ball registration is now open. 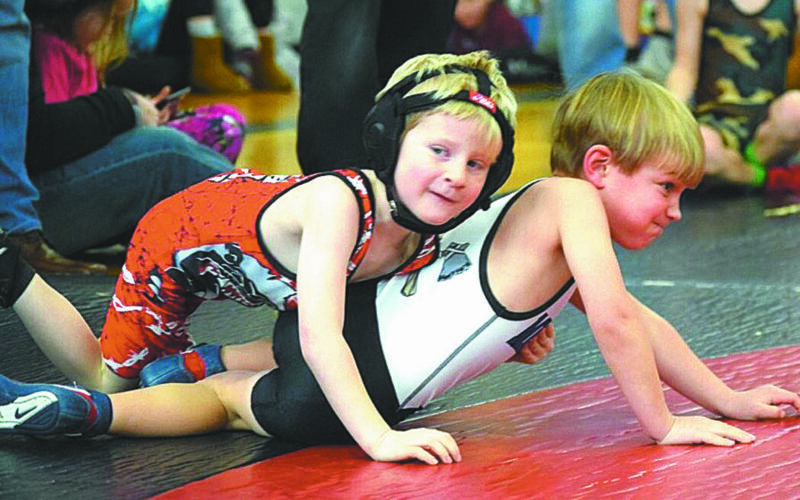 All children, living in Nashua and ages 4-11 as of April 30, 2016, are eligible to play. To register, visit www.nashuacalripken.org. The Nashua Parks and Recreation Department will be sponsoring a fall Babe Ruth baseball program starting in September. All current Babe Ruth League players age 13 and 14 are eligible to play. New this year, any 12-year-old moving up to Babe Ruth next spring can now play. There will be practices during the week and games on the weekend. The cost is $20. Registration forms are available online at gonashua.com or in the Parks and Recreation office in Greeley Park on 100 Concord St.
Fall late registration for the Nashua Youth Soccer League is now open. Boys and girls in Nashua and surrounding towns born between Sept. 30, 2002, and Oct. 1, 2010, are eligible. Registrations received now may be wait listed. Players can register online at www.NashuaYouthSoccer.org. The Southern New Hamspshire Cavaliers will have a Mini Mite limited travel hockey program for boys and girls ages 5-8. There are two 12-week sessions, or youths may register for the full year. Contact Paul Soule at president@cavaliershockey.org, or 978-375-5403 for more information. The Southern New Hampshire Cavaliers are now accepting players at the Mites, Squirts and Bantam levels. The teams will have two practices per week and 35 games during the season. If you have any questions, contact Paul Soule at president@cavaliershockey.org or 978-375-5403. The Nashua Elks Crusaders, a non-profit youth football and cheer organization, is seeking help from the community in purchasing new equipment and uniforms. 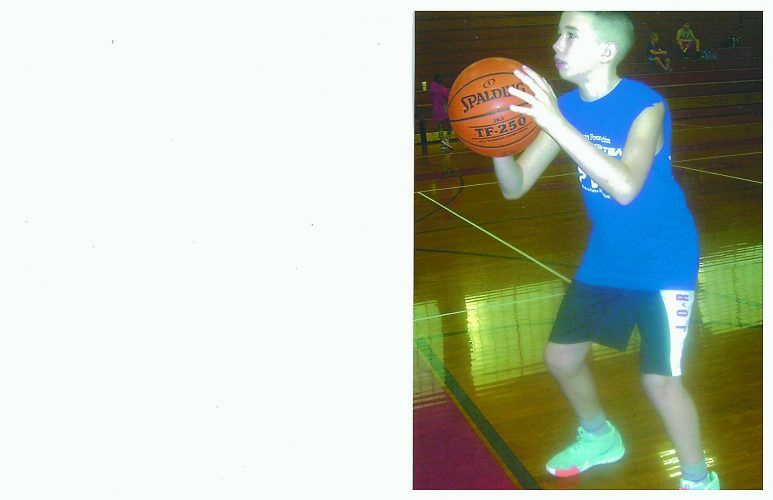 Donations can be made to Nashua Crusaders P.O. Box 7248 Nashua, NH 03063. Also, for more information on sponsorship opportunities, email necpresident15@gmail.com or deniserosher@comcast.net.